Each year The Content Wrangler hosts a three-day track on content strategy for attendees of the world's largest annual technical communication event, the tcworld conference and tekom Trade Fair. This year's event takes place November 6-8, 2013 in Wiesbaden, Germany and our track is loaded with presentations and mini-workshops designed to help you think strategically about the content you create. Join Scott Abel, The Content Wrangler, for a discussion with several of the presenters in the content strategy track. 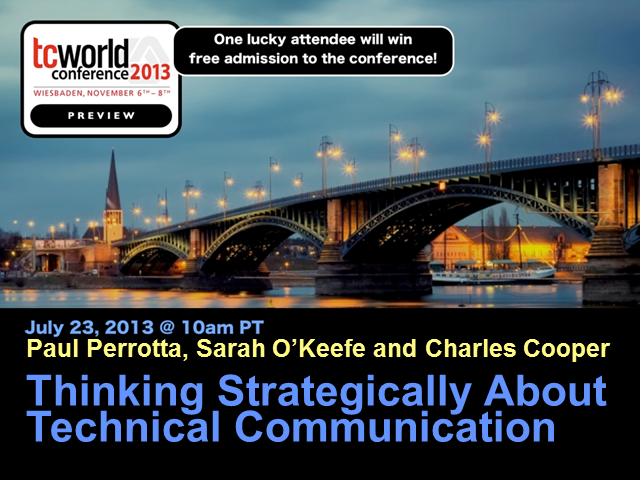 You'll hear from Paul Perrotta and Ben Jackson (Juniper Networks) about their focus on the customer experience; Sarah O'Keefe (Scriptorium Publishing) on the need for speed in technical communication projects, and Charles Cooper on advanced visualization techniques every technical communication professional needs to understand. One lucky registrant will win free admission to the tcworld conference and tekom Trade Fair -- an $1150 value.